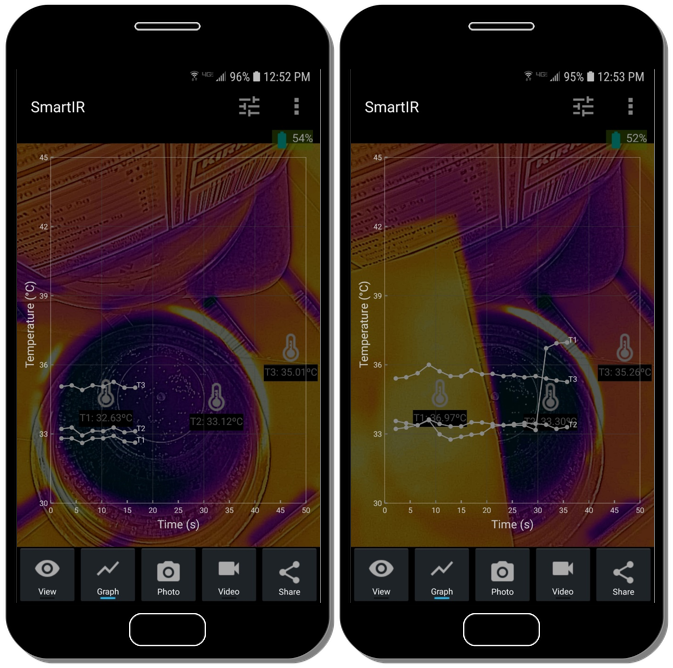 SmartIR is a smartphone app that I am developing to support infrared (IR) thermal imaging applications, primarily in the field of science and engineering, based on the FLIR ONE SDK. The development officially kicked off in July 2018. By the end of the month, a rudimentary version, to which I assigned V 0.0.1 (representing approximately 1% of the work that needs to be done for a mature release), has been completed. 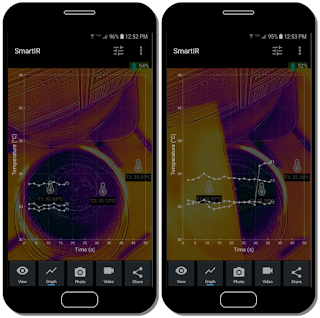 Although a very early version, SmartIR V0.0.1 can already support some scientific exploration. 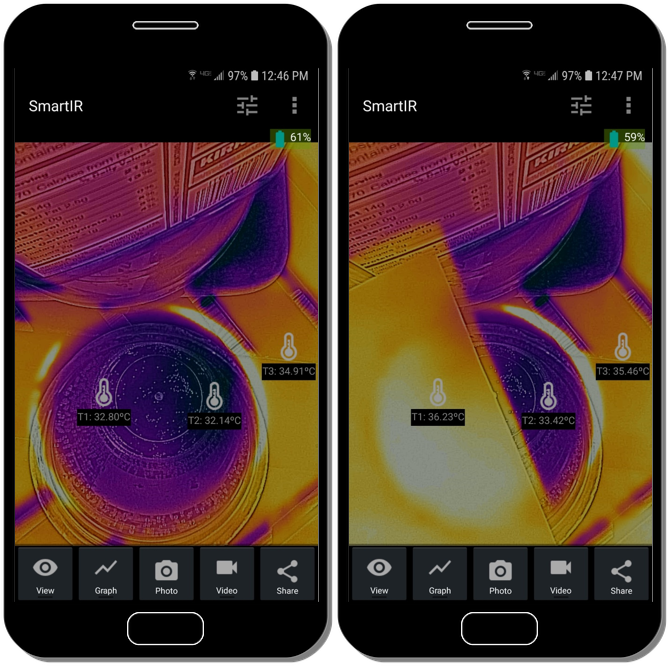 In this article, I share the results from doing the can't-be-simpler experiment that I did back in 2011 with a FLIR I5. This experiment needs only a cup of water, a piece of paper, and, of course, an IR camera (which is FLIR ONE Pro Generation 3 in my case). When a piece of paper is placed on top of an open cup of tap water that has sit in the room for a few hours, it warms up -- instead of cooling down -- as a result of the adsorption of water molecules onto the underside of the paper and the condensation of more water molecules to form a layer of liquid water, as shown in Figure 1. 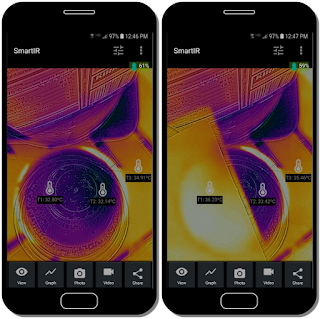 While the user can observe this effect with any thermal camera, it is sometimes useful to also record the change of temperatures as time goes by. To do this, SmartIR allows the user to add any number of thermometers to the view (and move or delete them as needed) and show their temperature readings in a time graph on top of the thermal image view (this is sort of like the translucent sensor graph in my Energy2D computational fluid dynamics simulation program). Figure 2 shows the time graph of temperatures. To study the effect, I added three thermometers: one for measuring the ambient temperature (T3), one for measuring the temperature of water (T2), and one for measuring the temperature of the paper (T1). Note that, before the paper was placed, T1 and T2 both measured the temperature of the water in the cup. As today is pretty hot, T3 registered higher than 35 °C. Due to the effect of evaporative cooling, T2 registered about 33 °C. When a piece of paper was put on top of the cup, T1 rose to nearly 37 °C in a few seconds! SmartIR is currently only available in Android. It hasn't been released in Google Play as intense development is expected to be under way in the next six months. A public release may be available next year.